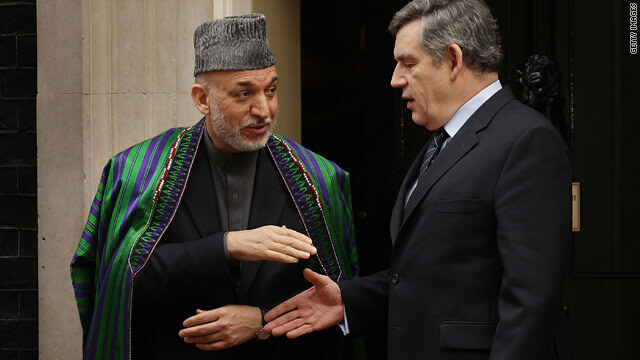 Afghan President Hamid Karzai meets British Prime Minister Gordon Brown Thursday ahead of the London meeting. Karzai said country moving "slowly but surely toward the end goals of peace and stability"
London, England (CNN) -- A plan by the Afghan government to reintegrate members of the Taliban into law-abiding society got strong support Thursday at a conference on Afghanistan. At the conclusion of the one-day meeting here, participants in the talks issued a communique expressing their approval of the plan that Afghan President Hamid Karzai introduced earlier in the day. "We must reach out to all our countrymen, especially our disenchanted brothers who are not part of al Qaeda or other terrorist networks," Karzai said during the London Conference on Afghanistan -- a meeting of more than 60 countries and organizations looking for ways to steer the country away from the grasp of militants. A central focus of the summit was the $500 million pay-for-peace proposal to bring Taliban fighters into the civilian fold if they promise to renounce violence. The money would create jobs and housing in an effort to moderate the attitudes of Taliban fighters, helping them return to civilian life. Major international donors were asked to pledge money for the effort, and U.S. Secretary of State Hillary Clinton announced after the meeting that the U.S. military in Afghanistan has funds at its disposal to use to support the program. She noted that while she didn't expect top Taliban leaders to accept the proposal, "there are many members of the Taliban who will see this chance to re-enter society ... to be attractive enough to test." The U.S. government is trying to change the "political environment so that those who continue to call themselves Taliban consider themselves isolated," she added. On the security front, Afghanistan said it intends to transition some provinces to full Afghan security control by the end of this year, have half the country's provinces under Afghan security control within three years, and take full responsibility for security inside its borders within five years. To that end, the Afghan National Army will increase the numbers of its troops to 171,600, and the Afghan National Police will increase to 134,000 personnel by October 2011, the communique said. If these plans are successful, Clinton said, the United States could begin to transition U.S. troops out of Afghanistan in July, 2011. "It's not an exit strategy, it's about assisting the Afghans" in taking responsibility for their own security, she explained. British Foreign Minister David Miliband, hosting a news conference after the end of the one-day meeting, said conference participants agreed that 2010 was going to be a "decisive year" in the Afghan campaign to fix the country's struggling economy and put down insurgent activity. Miliband cited the refreshed counterinsurgency effort and the new government's determination as keys in moving the process forward. The conference was co-hosted by Karzai, British Prime Minister Gordon Brown, and U.N. Secretary-General Ban Ki-moon. Clinton, NATO chief Anders Fogh Rasmussen and other key diplomats were also there. Rangin Spanta, the outgoing Afghan foreign minister, said at the news conference that his country was ready to "take more responsibility and demonstrate ownership" for its affairs but that to do so, it needed the support of the international community. International donors pledged more funds to Afghan reconstruction and security programs in the course of the meeting, but said the support was conditional on "the government's progress in further strengthening public financial management systems, reducing corruption, improving budget execution, (and) developing a financing strategy," the communique said. Sworn in after a fraud-marred presidential election last year, Karzai said his country was moving "slowly but surely toward the end goals of peace and stability," and he vowed to tackle corruption. The Afghan president said he would establish a national council for peace reconciliation and integration for former Taliban members , followed by a "peace jirga" -- a traditional gathering of Afghan tribal leaders -- and said he hoped Saudi Arabia's King Abdullah would play a "prominent role." "We ask all neighbors, particularly Pakistan, to support our peace and reconciliation endeavors," he said. "We are looking forward to the international community supporting this." Karzai has also suggested high-level Taliban commanders could take part in an Afghan government in the future. This week, the United Nations removed several members of the Taliban from a blacklist, suggesting negotiations could take place in the not-too-distant future. When asked whether the Taliban could play a role in the future of Afghanistan, Gen. Stanley McChrystal, the top U.S. military commander there, has said he thinks "any Afghans can play a role if they focus on the future and not the past." Richard Holbrooke, the U.S. Special Representative for Afghanistan and Pakistan, has expressed skepticism about whether senior Taliban leaders could join an Afghan government, saying negotiations now are focused on lower-level foot soldiers. U.S. military intelligence estimates that the Taliban now has shadow governments in 33 of 34 provinces, raising questions about whether insurgents will be motivated to reintegrate. In a statement addressing the conference, the Taliban said the West has held conferences in the past to discuss Afghanistan's future, but there is only one solution to end the conflict: withdrawal. "It is a matter of great sorrow that the invaders led by U.S.A. are bent on sticking to the military approach of the issue," the statement said. "We want to say clearly, if the invaders want to save themselves from further financial and life losses, they should not deceive their people by illusory plans and strategies, nor they should waste time on them, or make our people face further sufferings and problems. They should accept the solution put forward by the Islamic Emirate, which is the full withdrawal of the invading forces from our country." Clinton also unveiled an action plan for women of Afghanistan, including programs focused on security for women, leadership training and access to justice, education and health services, as well as economic opportunity. She acknowledged concerns that Taliban reintegration could cause setbacks for Afghan women seeking greater individual freedom and opportunities. But, she said, those concerns would be addressed if Taliban members abide by the conditions of the peace offer. "They have to abide by the constitution and the laws of Afghanistan," she said. "That means girls are able to go to school. Girls and women are entitled to get health care. ... Women have the right to participate in the government." The plan, she says, "stands in stark contrast to al Qaeda's recently announced agenda for Afghanistan's women, which consists of attempting to send female suicide bombers to the west." Earlier this week, Ban named a veteran Swedish diplomat, Staffan de Mistura, as the new top U.N. official in Afghanistan. De Mistura, who begins his stint on March 1, was a former U.N. representative in Iraq. A second major international gathering on Afghanistan is expected to take place in a few months in Kabul, Afghanistan's capital.